"Powered flight" redirects here. For birds, see Bird flight. For insects, see Insect flight. Aircraft propulsion nearly always uses either a type of propeller, or a form of jet propulsion. 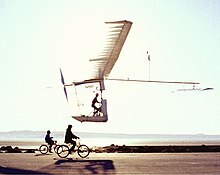 Other potential propulsion techniques such as ornithopters are very rarely used. A propeller or airscrew comprises a set of small, wing-like aerofoil blades set around a central hub which spins on an axis aligned in the direction of travel. The blades are set at a pitch angle to the airflow, which may be fixed or variable, such that spinning the propeller creates aerodynamic lift, or thrust, in a forward direction. Contra-rotating propellers have one propeller close behind another on the same axis, but rotating in the opposite direction. A variation on the propeller is to use many broad blades to create a fan. Such fans are usually surrounded by a ring-shaped fairing or duct, as ducted fans. The first powered flight of an aircraft was made in a steam-powered dirigible by Henri Giffard in 1852. Attempts to marry a practical lightweight steam engine to a practical fixed-wing airframe did not succeed until much later, by which time the internal combustion engine was already dominant. From the first controlled powered fixed-wing aircraft flight by the Wright brothers until World War II, propellers turned by the internal combustion piston engine were virtually the only type of propulsion system in use. The piston engine is still used in the majority of smaller aircraft produced, since it is efficient at the lower altitudes and slower speeds suited to propellers. Turbine engines need not be used as jets (see below), but may be geared to drive a propeller in the form of a turboprop. Modern helicopters also typically use turbine engines to power the rotor. Turbines provide more power for less weight than piston engines, and are better suited to small-to-medium size aircraft or larger, slow-flying types. Some turboprop designs mount the propeller directly on an engine turbine shaft, and are called propfans. Rotorcraft have spinning blades called a rotor which spins in the horizontal plane to provide lift. Forward thrust is usually obtained by angling the rotor disc slightly forward so that a proportion of its lift is directed backwards; these are called helicopters. Other rotorcraft are compound helicopters and autogyros which sometimes use other means of propulsion, such as propellers and jets. The rotor of a helicopter may, like a propeller, be powered by a variety of methods such as an internal-combustion engine or jet turbine. Tip jets, fed by gases passing along hollow rotor blades from a centrally mounted engine, have been experimented with. Attempts have even been made to mount engines directly on the rotor tips. Airbreathing jet engines provide thrust by taking in air, compressing the air, injecting fuel into the hot compressed air mixture in a combustion chamber, the resulting accelerated exhaust ejects rearwards through a turbine which drives the compressor. The reaction against this acceleration provides the engine thrust. Jet engines can provide much higher thrust than propellers, and are naturally efficient at higher altitudes, being able to operate above 40,000 ft (12,000 m). They are also much more fuel-efficient at normal flight speeds than rockets. Consequently, nearly all high-speed and high-altitude aircraft use jet engines. The early turbojet and modern turbofan use a spinning compressor and turbine to provide thrust. Many, mostly in military aviation, add an afterburner which injects extra fuel into the hot exhaust. Use of a turbine is not absolutely necessary: other designs include the crude pulse jet, high-speed ramjet and the still-experimental supersonic-combustion ramjet or scramjet. These mechanically simple designs require an existing airflow to work and cannot work when stationary, so they must be launched by a catapult or rocket booster, or dropped from a mother ship. Rocket propulsion offers very high thrust for light weight and has no height limit, but suffers from high fuel consumption and the need to carry oxidant as well as propellant. Rocket-powered aircraft have been experimented with, and during the Second World War the Messerschmitt Komet fighter was developed and used operationally. Since then they have been restricted to specialised niches, such as the Bell X-1 which broke the sound barrier or the North American X-15 which was capable of flying at extremely high altitudes at the border with space as it was not dependent on atmospheric oxygen. Rockets have more often been used as a supplement to the main powerplant, typically in the case of rocket-assisted take off to give more power for a heavily loaded aircraft or reduce the takeoff run. In a number of designs such as the prototype "mixed-power" Saunders-Roe SR.53 interceptor a rocket was used to provide high-speed climb and speed to reach the target while a smaller turbojet provided a slower and more economical return to base. The ornithopter obtains thrust by flapping its wings. When the wing flaps, as opposed to gliding, it continues to develop lift as before, but the lift is rotated forward to provide a thrust component. Working devices have been created for flight research and as prototypes, but the vertical oscillation of the fuselage, which tends to accompany the wing flapping, limits their usefulness. The only practical application is a flying model hawk used to freeze prey animals into stillness so that they can be captured. Toys in the form of a flying model bird are also popular. 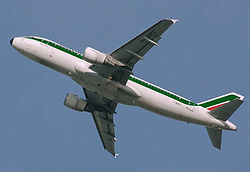 A fixed-wing aircraft obtains lift from airflow over the wing resulting from motion due to forward thrust. A few other types, such as the rotary-winged autogyro, obtain lift through similar methods. Some types use a separate power system to create lift. These include the rotary-winged helicopter and craft that use lift jets (e.g. the flying bedstead). A hot air balloon requires a power source (normally a gas burner) for lift, but is not normally considered a "powered aircraft". Wikimedia Commons has media related to Aircraft by method of propulsion.